Motorhome claims come in all different shapes and sizes. Most involve minor bumps or scrapes, but there are some that are, shall we say, more ‘remarkable’. Since 2005 Caravan Guard has helped thousands of customers settle their motorhome insurance claim. This infographic gives you an idea of the range of claims we deal with and the circumstances in which they occur. Broken windscreens are an incredibly common claim for motorhome owners. The large surface area of a motorhome windscreen seems to attract stones and debris often thrown up by other vehicles on the road. Over 4000 customers have claimed for this kind of damage in the last eight years and collectively they’ve racked up a claims bill of over £1.1million! Small windscreen chips can quickly turn into big cracks so it’s always worth getting your insurance company’s windscreen repairers to take a look ASAP. Unlike a windscreen replacement, a chip repair can take less than 30 minutes and won’t mean paying an insurance excess. Certain locations can prove problematic for motorhomers; we worked out that since 2005, 144 claims occurred in a car park, many as a result of collisions with other vehicles or entry barriers. Underpasses, low bridges and even tree branches also pose a threat. It’s always a great idea to have your motorhome’s height dimensions within arms length of the steering wheel so you can quickly check if your motorhome will fit underneath low barriers and bridges which often display maximum vehicle height. Proving that theft remains a genuine threat in the motorhoming world, our research revealed a total of 99 claims from customers whose catalytic convertors had been stolen. Ever wondered why convertors are so attractive to thieves? They contain precious metals Platinum and Palladium which can be worth around £30 per gram! In 2011 we reported on why motorhome catalytic convertor theft was becoming more commonplace but the last year has seen theft claims reduce and it remains quite a rare occurence overall. Motorhome key theft is another growing problem for policyholders. A total of £173,610 has been paid out for stolen or lost keys. Check our tips to defend against having your motorhome keys stolen, which includes ideas for extra home security and specific motorhome anti theft devices. Potholes, handbrake problems and diesel-filled water tanks are also factored in some of our motorhome customer’s most common claims. 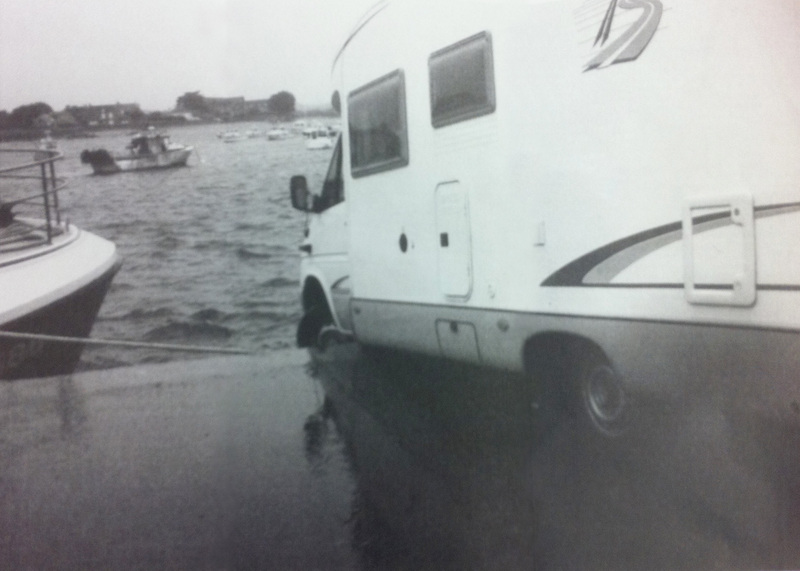 50% of those who made a motorhome handbrake claim actually forgot to put it on – oops, easily done though! One handbrake incident saw a motorhome roll to the edge of harbour and left it teetering over the edge as this picture shows. According to a recent study by the Asphalt Industry Alliance (AIA), the existing UK pothole backlog will take 12 years for local authorities in England and Wales to clear, while motorists in London face a 14-year wait – you’ll have to try to drive your motorhome around the holes in the meantime folks! We have also had quite sizeable claims from customers who’ve had gas explosions in their motorhome, highlighting just how important it is to get gas appliances tested annually. Believe it or not we’ve dealt with claims from customers who’ve got themselves and their motorhomes into scrapes with the emergency services – now that is out of the ordinary! We’ve had instances where speeding ambulances, fire engines and police cars have clipped motorhomes on narrow roads. We feel a tad sorry for the customer who bumped into a police car! And most bizarrely of all, a few years ago a customer made a claim when her motorhome was damaged by flying debris blown by the rotor blades of a emergency response helicopter, after it landed nearby to tend to a person injured in an unrelated accident. So there you have it, a quick run down of our everyday to bizarre motorhome insurance claims. If anything, these claims just prove why it’s important to have comprehensive insurance cover to pay for repairs, as you can never predict what dangers lie in store for your motorhome! Have you ever made a not so typical motorhome insurance claim? Share your story in the comment box below. I used the loo on our motorhome one morning a couple of years ago and then drove to one of the highest passes in the French Alps. At the top I stopped for a jimmy riddle and found that the lever on the loo was jammed tight. I foolishly pushed it open and the resulting blast of air plus other matter hit me full in the face. This was obviously due to the thin air at the top. My wife has only just stopped laughing. Oops Jeremy. I don’t suppose any of us would have expected that to happen. It’s a great story to tell and at least you now see the funny side! Look forward to hearing about more motorhome mishaps – they happen to even the most seasoned motorhome owners!